Canongate forms one of the lower parts of the Edinburgh's Royal Mile as it makes its way downhill from Edinburgh Castle to the Palace of Holyroodhouse. On the north side of the road lies Canongate Kirk, the church that serves, amongst others, the residents of the Palace of Holyroodhouse when they are at home. 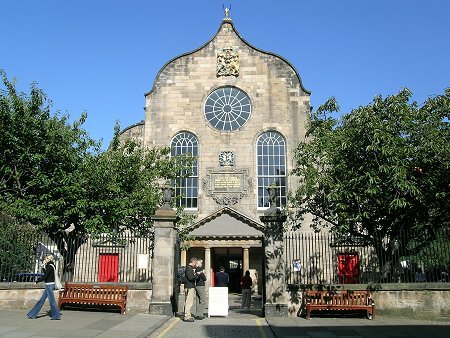 The Canongate frontage of the Kirk (see main image above) is formed by its Dutch gabled south end, slightly hanging back from the road itself behind a wall and trees. 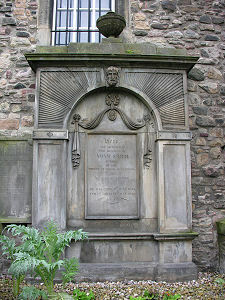 Beyond it lies a kirkyard home to many of the great and good of Edinburgh's past. These include the economist Adam Smith, and, perhaps, Mary Queen of Scots' Italian secretary, David Rizzio who was murdered in Mary's presence at Holyrood Palace on 9th March 1566. The story of the establishment of the church is summarised on a plaque on the south wall of the church above the door (see image, left). This notes that in 1688 King James VII/II decided that a bequest left by Thomas Moodie in 1649 for the construction of a church should be used to build Canongate Kirk. 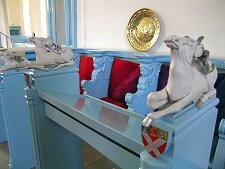 Above the plaque is the crest of Thomas Moodie, while at the top of the gable is the Royal Crest, not of James VII/II but of William III who had displaced James by the time the church was completed in 1691. 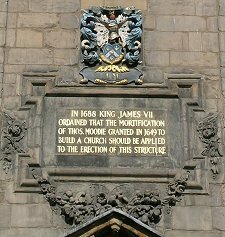 What the plaque does not record is that James generously decided to use someone else's money to build the church to allow him to convert the old Canongate Parish Church, formed in the nave of Holyrood Abbey, into a chapel for the Order of the Thistle. 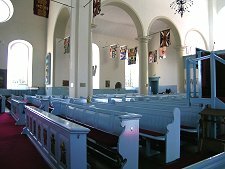 The church that emerged in 1691, to a design by James Smith, was remarkable in a Scotland which at the time was strongly Presbyterian. It is in the shape of a Roman cross, aligned north-south. Some have gone as far as to suggest that the builders were deliberately building a church that could easily be converted for Roman Catholic use should the Reformation of 130 years earlier have unwound. 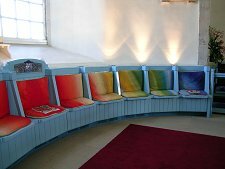 Internally the church has been renovated and rearranged several times. Between 1946 and 1954 east and west galleries in the transepts were removed and the apse was reopened. At the same time the remaining south gallery was lowered. The most recent renovation was undertaken in 1991 by Stewart Tod and Partners and the result is the light and airy interior you see today. 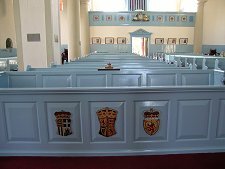 The predominant colour now is the light blue in which the pews and fittings are painted. 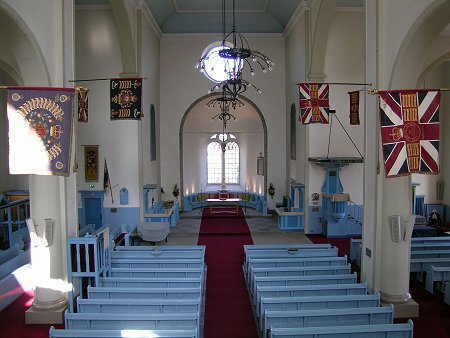 It's not a colour you could imagine choosing for a church, but it works remarkably well, especially when set against the maroon of the carpets and splashes of colour of the flags hanging in the nave and aisles.